Are you ready for spring yet? In spite of it being like 20 below outside, the sun has been shining for a couple of days here and I'm in better spirits than I was on Sunday when I wrote my last post. Back in December I showed you a bench that I painted with Miss Mustard Seed Milk Paint (MMSMP) in Typewriter. I still lament not being able to get better pictures of this bench. Because today I want to show you another table that I painted with the leftover paint from this bench. Looks very different you say? You may want to first see the steps I took to get the look I did on the bench and to see how I mixed the paint. This table was WAY worse for the wear. I think the legs had even been cut down because this style typically is a little taller and has some sort of ornate feet on it. If I were to guess, I would say that a dog had chewed on the feet to the extent that they had to be removed. The top of the table and a couple of spots on the legs appear to have been gnawed on. At least I choose to believe it is a dog, and not some other type of varmit! A little gluing was necessary to keep all the pieces together. I did not bother to try to fix any of the other cracks and damage on the table. I do rather wish that the little pediment that is supposed to be in the center of the lower framework was still there, but alas it is not. Ok. Here is what I did to get this look - versus the black look of the bench. 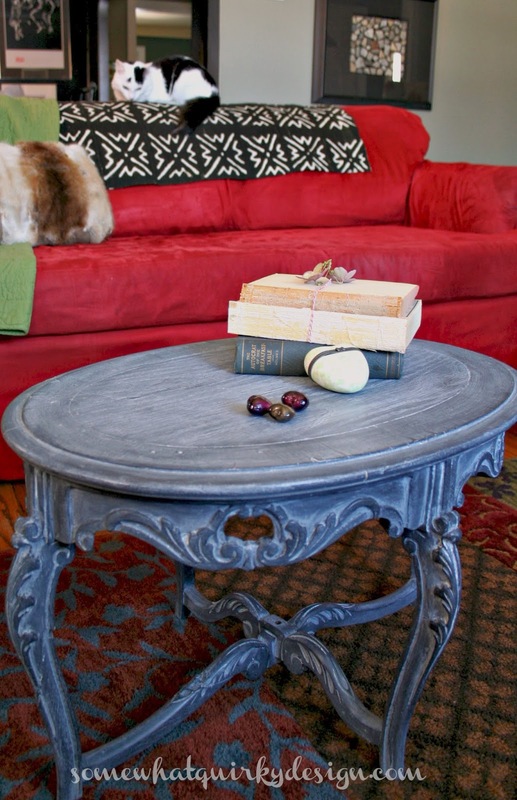 -I used the leftover mix of Typewriter Miss Mustard Seed Milk Paint and Bonding Agent. Leftover, as in within a few days of painting the bench. -I added water. AGAIN! Note: the Bonding Agent appears to thicken the paint over time. This is the 4th or 5th time I have diluted this batch of paint. It still works like a charm. -Covered the entire table with 2 coats of the mix. -Gently sanded the entire table - not the recessed areas - to smooth everything up a bit. -Waxed and wiped the entire piece with Miss Mustard Seed White Wax twice, leaving more wax in the recessed areas. I'd say the finish is like a cross between grey driftwood and zinc. I did not intentionally distress this piece. I figured it would look distressed enough with the damage and the contrast of the white wax. There are a few places where the wood shows through, and that's ok. I love this finish. 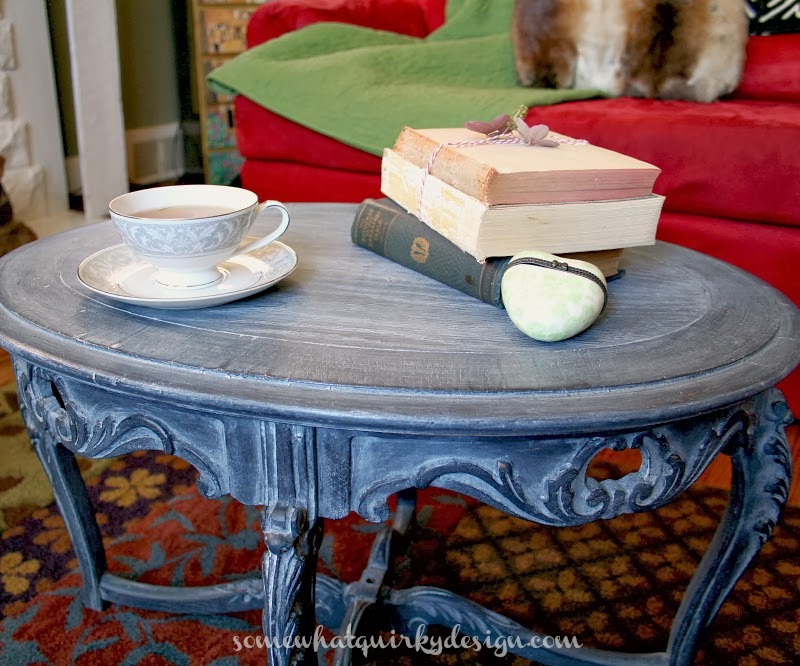 Frankly, I don't think it is the best look for this style of table, but it does provide an excellent sample of what you can do with just a dark milk paint and direct application of MMS White Wax. 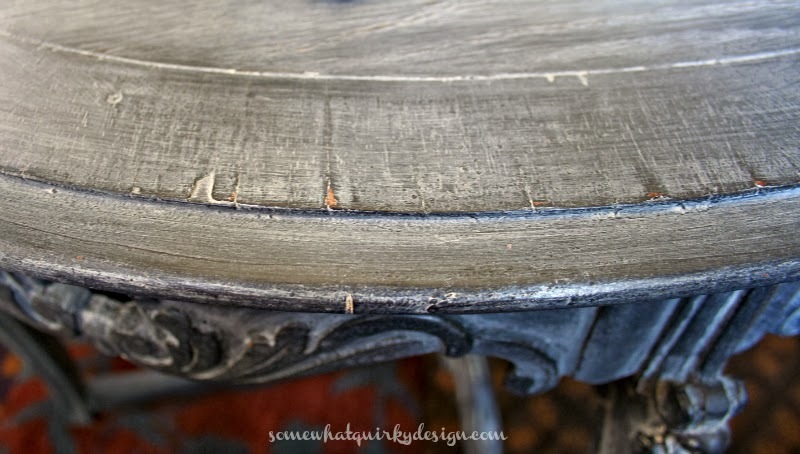 I see this finish being really nice on picture frames, table tops, outdoor accessories . . . Just remember if you are using it outdoors you will need to use some type of outdoor rated protective finish over everything. Modern Masters makes an excellent, non-yellowing (very important), flat outdoor protective finish. I don't really have a place to put this table so I will probably sell it. But be assured, I will use this finish again. Hope you're holding up to the weather and staying happy and healthy. How did I not know you had a red couch? You wild woman you. How did the color change from black to blue? I love the table and the finish. The white wax is awesome! I need to try that white wax! Pretty finishes on both pieces. 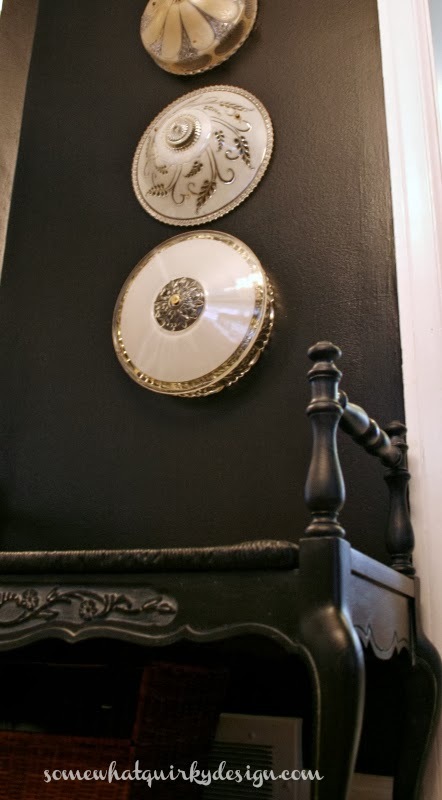 I have never used miss mustard milk paint. Bought some but haven't found the right piece. I love them both and I think the paint showing through it perfect! Great job! I'm ready to paint. The wet weather makes it hard to do and my home is so small. Mr. H wouldn't like that! 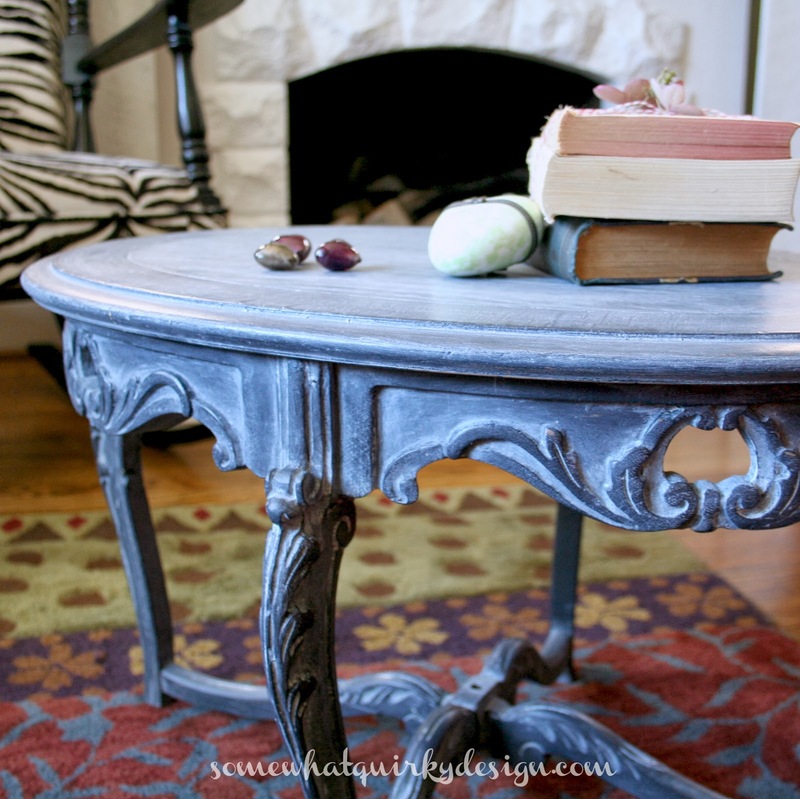 I have never used Miss Mustard Seed paint- just Annie Sloan Chalk Paint. Miss Mustard Seed paint is now sold at a local shop. Have your used both? Can you give me a comparison? I would love to buy something here in town instead of making the 40 minute drive for ASCP. 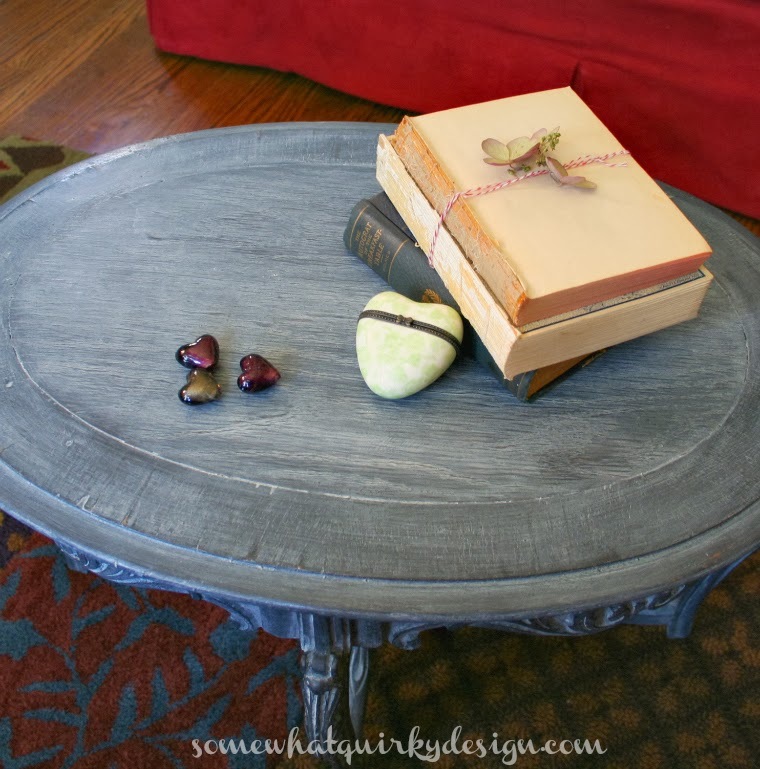 That is a gorgeous finish and a beautiful table, Karen! I cannot wait to be done painting walls and start some furniture painting! It's really very pretty, and I actually like the finish on this style of table. Thank you for explaining the technique. 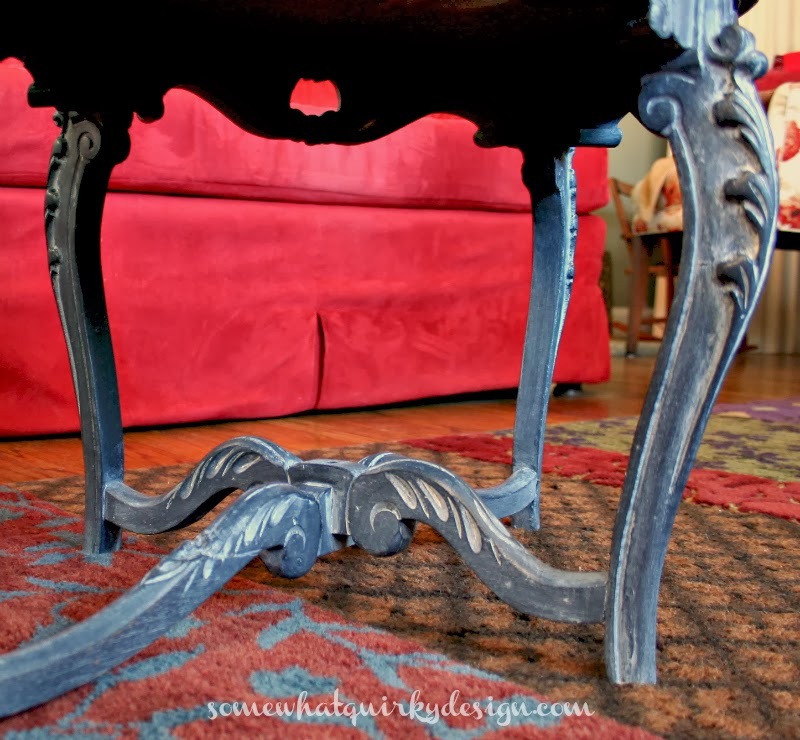 What a gorgeous table and I do love the finish. I would do that finish a lot too. I did not know about the Modern Master's outdoor finish. Thanks for letting us know. I just got a batch of Typewriter and have used it on two different dressers with Hemp Oil and MMS Furniture Wax. I've been wanting to try the White wax, so I'm glad I came over to see what it would look like. 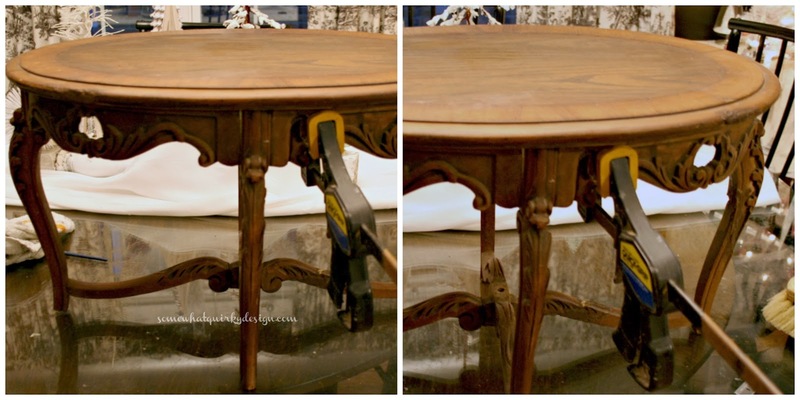 The finish you used with the white wax really makes the carving stand out on your table. I had no idea there was such a thing as white wax, but I may be looking to use it in the future! Nicely done! I love it with the just the paint, but the white wax really brought out the details. I love that little table. You did an awesome job. Great color.